No one would call this the golden era of teaching, not with school budgets getting slashed, state governors routinely scoring political points at teachers' expense, and the federal government forcing schools to teach to the test. But if today's teachers are feeling beleaguered, they can always look back to a set of historical "documents" for a little comfort. For decades, museums and publishers have showcased two lists -- one from 1872 (above) and another from 1915 (below) -- that highlight the rigorous rules and austere moral codes under which teachers once taught. You couldn't drink or smoke. In women's cases, you couldn't date, marry, or frequent ice cream parlors. And, for men, getting a shave in a barber shop was strictly verboten. But are these documents real? 1. Teachers will fill the lamps and clean the chimney each day. 3. Make your pens carefully. You may whittle nibs to the individual tastes of the pupils. 6. Women teachers who marry or engage in improper conduct will be dismissed. 7. Every teacher should lay aside from each day's pay a goodly sum of his earnings. He should use his savings during his retirement years so that he will not become a burden on society. 8. Any teacher who smokes, uses liquor in any form, visits pool halls or public halls, or gets shaved in a barber shop, will give good reasons for people to suspect his worth, intentions, and honesty. 9. The teacher who performs his labor faithfully and without fault for five years will be given an increase of twenty-five cents per week in his pay. 3. You must be home between the hours of 8 PM and 6 AM unless attending a school function. 6. You may not ride in a carriage or automobile with any man except your father or brother. 11. Your dresses may not be any shorter than two inches above the ankles. 12. To keep the classroom neat and clean you must sweep the floor at least once a day, scrub the floor at least once a week with hot, soapy water, clean the blackboards at least once a day, and start the fire at 7 AM to have the school warm by 8 AM. via Peter Kaufman, mastermind of the Intelligent Channel on YouTube. I dread to think what den of iniquities these ‘Ice-Cream Parlours’ were. When reading antiquated stuff like this it’s hard to figure how they could be so irrational, and how they could presume to tell their employees what not to do in their personal lives. Reading these rules, my only conclusion is that the person who wrote them was a stupid jackass. Telling your teachers not to go get ice cream is like telling some guy at the bus stop not to eat bananas. It’s just arbitrary and overstates their authority. If my boss issued a rule telling me not to eat ice cream I’ll say, “OK, and on that note I don’t want you drinking iced tea.” My authority to issue that order is equal to his. Unfortunately, rules such as this do not overstate the authority of the employers of the times. Personally, I think telling someone with a dark skin colour that they can’t get on the same bus as me is even more insane, but that was still the law in the US in my lifetime. So were jokes made on TV that would be found offensive and discriminatory now for gender, preference and many other reasons.nWonder what rules we think are acceptable now will be unacceptable in 50 years time? Image what people in 100 years will say about our rules today. I worked in the Pupil Records Department of a public school district for many years. In the back of an old file cabinet I found student attendance books dated around 1895 to 1905. Several pages in the front of each book contained these same rules. The books are now part of the collection of the local museum. You mean… we don’t have to scrub the floors now? What is never mentioned in discussing these lists, real or not, is that similar ones applied to all other occupations at the time as well. All employees were filling lamps and cleaning chimneys, and everyone was judged for how they behaved in public. These lists tend to polarize around the alleged oppression of teachers, but there are and always were people far more oppressed who are left out of the conversation by virtue of the list being presented without context. Cleaning the “Chimney” doesn’t mean cleaning what is part of the fireplace… The glass part of an oil lamp gets blackened from the soot the blame makes …. That’s the part that needed to be cleaned daily . The article refers to the authenticity of the rules. They are remarkably similar to rules for nurses- see link below. A strange coincidence or just taken from a common template? Yeah, today these rules seem arbitrary and stifling. But in those days when most of the families in rural areas were working from dawn until dusk and the 8 hour work day was a dream of the future, a “professional” teacher lollygagging at the ice cream parlor in the afternoon might have made them seem a slacker in their job. Most of Teacher’s students ran home after school to do farm chores until supper. Can’t ride in an auto with someone other that your dad or brother? She fixed that. Went in with her teacher friends and they bought their own auto. She and her teacher friends spent a month every summer traveling and camping out of that old model A, motoring to a different destination (on roads that pre dated the interstate highways) each summer: Yellowstone park, Glacier park, New York City, the Grand Canyon, Yosemite and the Redwood forest, and Washington D.C.
Snopes has debunked these lists and says they’ve been around, in one form or another, since the 1930s, and are likely not authentic. Here are 1870 Rules and Regulations for the governance of public schools, and none of the rules mentions the dating life of the teachers. 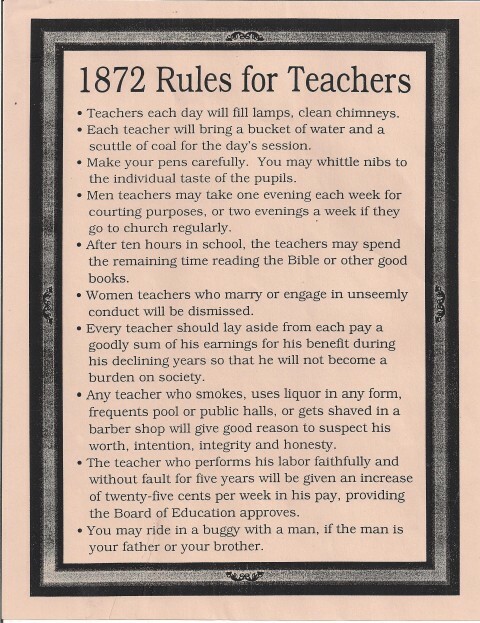 I had seen the 1872 and 1915 “rules” and sought them out again while doing research for a nonfiction book, in which one of the subjects was a divorcee teaching school in 1880. I thought the divorce would have rendered her ineligible to shape young minds, but evidently that was not the case. Actually, I am a substitute teacher and I follow all the rules above except for the length of skirt and room maintenance. I wear black as a type of uniform. I am not married nor do I travel. I am home by 8 and up by 6. I wouldn’t say a jackass wrote these rules. I think someone who had been teaching and understood the all encompassing commitment it takes, wrote these rules. During those times, of wild west type behavior with men, carrying guns, drinking etc.I’m sure many of these rules were meant to protect vulnerable women. Context is everything. Johnny, I wasn’t aware that the teachers had any rules today. Other than collect their paycheck. 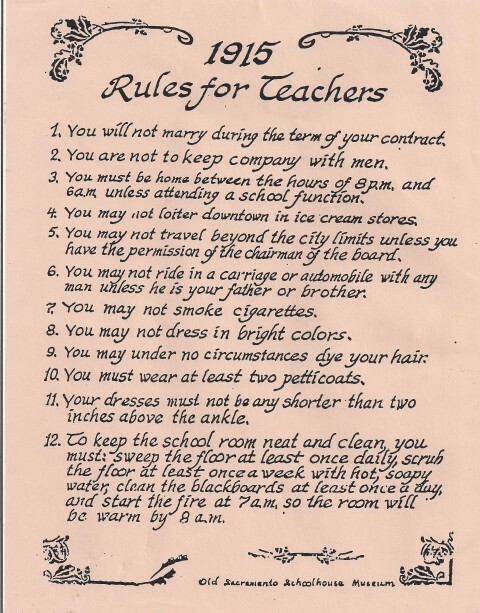 I have no opinion on the authenticity of these particular rules, but my grandmother was a private kindergarten teacher in Terre Haute, Indiana in the 1930s and appearing in public without gloves and hat was grounds for dismissal. 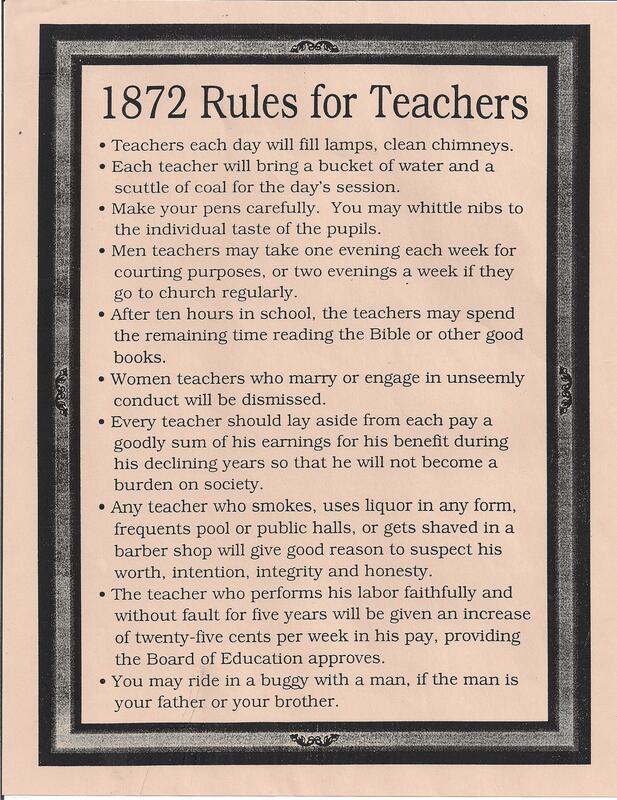 Maybe if we had rules like these today, we wouldn’t have so many women teachers sleeping with their students. Wow! Nice Ray, because we know that it only happens with teachers and that men NEVER do things like that! The media makes a bigger deal out of the women, the stories about the misjudgements of men just got old! I agree with the article that the authenticity of this set of rules is in question. However, the concern about a teacher hanging around in an ice cream parlor was not with eating ice cream. Rather, it was that they would be getting too familiar with the kids outside of school time. They were expected to maintain a “professional distance”. Why could teachers, 1800’s, not get shaved in a barber shop?